With the slower pace between semesters, take time to check out campus exhibits like "To Care for Others: 100 Years of Nursing at Emory," which closes Jan. 31. 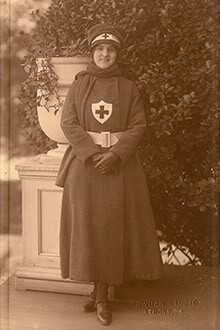 Here, Nell Hodgson Woodruff appears in a Red Cross nurse aide uniform, circa 1918. Image: Nell Hodgson Woodruff papers, Stuart A. Rose Manuscript, Archives and Rare Book Library. December has the holiday rush, but also brings some flexibility with the end of semester. While you’re spending away on gifts, food, decorating and other holiday expenses, there are still plenty of things to do on campus that are inexpensive, fun, informative and perfect for either entertaining the family or some well-deserved “you” time. 1. Experience the rhythms of BAMBIKA Beats. Watch the 2017 members of the Brotherhood of Afrocentric Men and Ngambika present BAMBIKA Beats, their annual fall step show that has been a semester in the making. Described as a form of percussive dance in which the participant's entire body is used as an instrument to produce complex rhythms and sounds, this event is sure to delight and amaze. BAMBIKA Beats will be held from 8-10 p.m. on Tuesday, Dec. 5, on Tarbutton Hall Plaza. It’s free. 2. Cheer the Emory Eagles basketball teams as they continue strong starts to their seasons. The Emory men's team plays Covenant College on Wednesday, Dec. 6, at 7 p.m. Can’t squeeze in a mid-week game? The Eagles play Guilford College on Saturday, Dec. 16, at 2 p.m. The week between Christmas and New Year’s is the Emory Classic tournament when the men’s team is scheduled against Illinois Wesleyan on Thursday, Dec. 28, at 2 p.m. then on Friday, Dec. 29, it’s Transylvania at 4 p.m. The women’s basketball team has two home games late in December. On Friday, Dec. 29, they play the Maryville (Tenn.) Scots at 4 p.m. and on Saturday, Dec. 30, they take on the Berry College Vikings at 6 p.m.
All home games are held in the gym of the Woodruff Physical Education Center. Admission is free and parking in the Peavine Deck across from the center is free. 3. Sip tea and nibble scones and pastries at AntiquiTEA. If you haven’t been to an AntiquiTEA, consider the Thursday, Dec. 7, event. AntiquiTEA is a monthly talk by one of the curators at the Michael C. Carlos Museum about one of the many pieces in the museum’s outstanding collection. The talks are always free, served with the refreshments and often linked to one of the museum’s current exhibitions. At the Dec. 7 AntiquiTEA, you can hear art history PhD candidate Shelley Burian discuss contemporary weaving traditions of Bolivian women, which she spent three months studying. Enjoy afternoon tea and scones as she shares the stories and work of several indigenous women from the region around Sucre, the constitutional capital of Bolivia. 4. Enjoy the music that you only hear this time of year. Glenn Memorial United Methodist Church presents Advent Lessons and Carols on Sunday, Dec. 10, for the 8:30 a.m., 11 a.m. and 5 p.m. services. The 11 a.m. service takes place in the historic Glenn sanctuary on the Emory campus, with 150 singers from Glenn’s children’s, youth and adult choirs and instrumentalists. Soloists include Cynthia Shepherd, soprano; Stephen Ozcomert, bass; and Kevin Burdette, internationally renowned operatic bass, who sang the role of Señor Russell in the Metropolitan Opera’s recent production of "The Exterminating Angel." Leading from the organ will be Emory University and Glenn Organist Timothy Albrecht, assisted by Todd Mueller, percussion, and Stuart Stevenson, principal trumpet with the Atlanta Symphony Orchestra. Later that day, head over to the Michael C. Carlos Museum for Santa’s Favorite Chamber Music. This annual event takes place in Ackerman Hall at 4 p.m. Old Saint Nick himself will visit to introduce some of his favorite classical works and give treats to good listeners. This concert is a part of the Emory Chamber Music Society of Atlanta’s Family Series and is free and open to the public. 5. View the new exhibition at the Pitts Theology Library. "Religion of the Heart: John Wesley and the Methodist Legacy in America" opens in the third floor Exhibition Gallery of the Pitts Theology Library on Monday, Dec. 11. It runs through March 9, but now is a good time before the busy spring semester to see this display from the Pitts Theology Library's extensive Wesleyana holdings. The exhibition looks at two aspects of the Methodist story: its rise and development in England (a statue of Wesley is in St. Paul’s Churchyard in London) and its establishment and history in the United States. While you can view the exhibition any time the library is open, tours are also offered. 6. Add another piece to your financial knowledge. “Financial Wellness: Documents for Life” is an online talk on Wednesday, Dec. 13, from 1 to 2 p.m. Financial wellness, like physical health and wellness, is a major benefit area and this presentation will provide an overview of what documents are needed to build a sound financial base. 7. Get up early to get inspired by the Emory Haiti Alliance. Emory Haiti Alliance will present on its June 2017 surgical trip to Haiti on Thursday, Dec. 14, beginning at 6:30 a.m. in the auditorium of Emory University Hospital. Faculty, resident, fellow and medical student leaders of the Emory Haiti Alliance will describe the outcomes of their trip this summer. The event is free and open to all interested. This event can be viewed remotely at Grady Memorial Hospital, Sherman Conference Room, Glenn Building; Emory Johns Creek Hospital, Administrative Conference Room; Emory Saint Joseph's Hospital, Education Center, Classroom 4; and Emory University Hospital Midtown, MOT Classroom 4. 8. Find out parenting tips to help with teens and kids with special needs. The Emory WorkLife Resource Center hosts two talks this month, one for parenting teens and one for parenting your child with special needs. “Parenting Your Teen: Giving Back” is a free, online presentation providing guidance on how you can help your teen feel useful, important and confident, showing them the benefits of helping others through volunteerism. Side benefits include polishing time management skills, developing empathy and enhancing their academic resumes. This talk is Thursday, Dec. 14, from 1 to 2 p.m. online. “Parenting Your Child with Special Needs: Positioning for the Future,” a crucial presentation will give you direction and confidence in securing your child’s future. This talk is Tuesday, Dec. 19, from 1 to 2 p.m. online. If you are unable to listen to the talks live online, they are recorded and sent to all Emory employees who register for them. 9. Learn how to stay fresh and avoid burnout as a caregiver. “Caregivers Network: Beating Caregiver Burnout” is an online talk to be held Wednesday, Dec. 20, from 1-2 p.m. The talk is offered at a crucial time, during the holidays, when the burdens of being a caregiver can accumulate and be the heaviest. Get tips in this free talk on how to stay fresh in your role, take care of yourself and successfully manage stress as a caregiver. 10. Take the opportunity to see three campus exhibitions closing early next year. “Unwritten Histories: Preserving Scrapbooks from the Collections” ends Jan. 21. See how several scrapbooks from the Rose Library collections were conserved. This work involved scrapbooks belonging to an early 20th-century African American vaudevillian; one of Emory’s earliest students; a mid 20th-century African American sorority sister; and an Atlanta LGBT activist during the 1980s and '90s. The exhibition is on Level 2 of the Woodruff Library and is accessible during library hours. Also in Woodruff Library, "A Question of Manhood: African Americans and World War I" continues through Jan. 31. The exhibit commemorates the centennial of the First World War, and celebrates African Americans who served as citizen-soldiers while they were still systematically denied full access to the promises of democracy. It is located on Level 10. “To Care for Others: 100 Years of Nursing at Emory,” closing Jan. 31, looks at the Emory nursing program from its original 1907 graduating class of 10 to the worldwide impact of Emory nurses today. See artifacts including a Civil War-era stethoscope and documents such as reproductions of Florence Nightingale’s letters held by Pitts Theology Library and a medical journal from World War I kept by Nell Hodgson Woodruff, the woman for whom Emory’s Nell Hodgson Woodruff School of Nursing is named. The exhibit is at the Woodruff Health Sciences Center Library, accessible during library hours.